Thunder Tiger has sort of become the forgotten Manufacturer with nothing much new of note for a while. However if the number of releases this year is anything to go by it will be a big year for them. 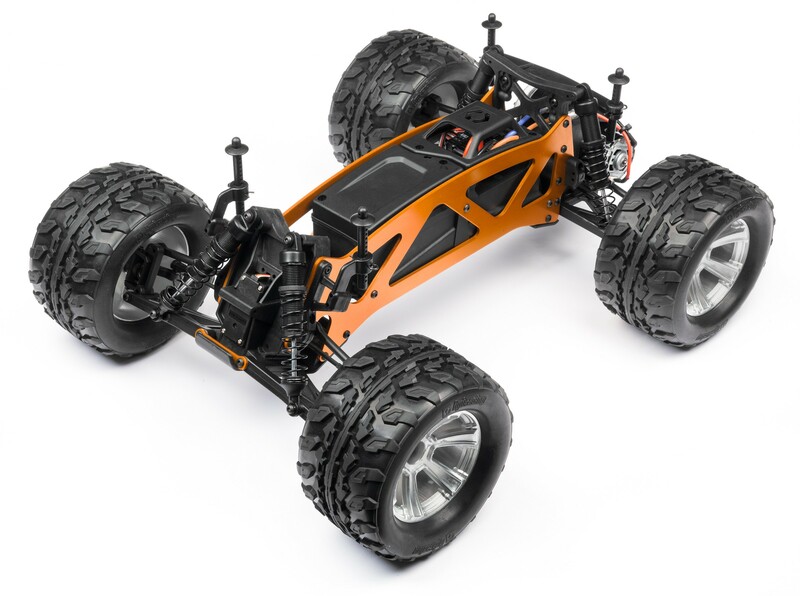 Yes, the name is very similar to a vehicle made by Axial, but it’s appearance is somewhere between the Axial unit and a 1:8 buggy. The Matte Black of K-ROCK is a new scale looking MT from Thunder Tiger, something akin to an armored truggy strike all the terrain vehicle. K-ROCK comes with advanced chassis construction, eye-catching tough body and the roll cage decorated with the LED lights and of course a matte black colour scheme. Of course brushless power is under the hood provided by a 2000kV motor and BLC-150C ESC. A Cougar GP2 2.4GHz radio system controls the beast while waterproof electronics keep the fun going when the going gets wet. 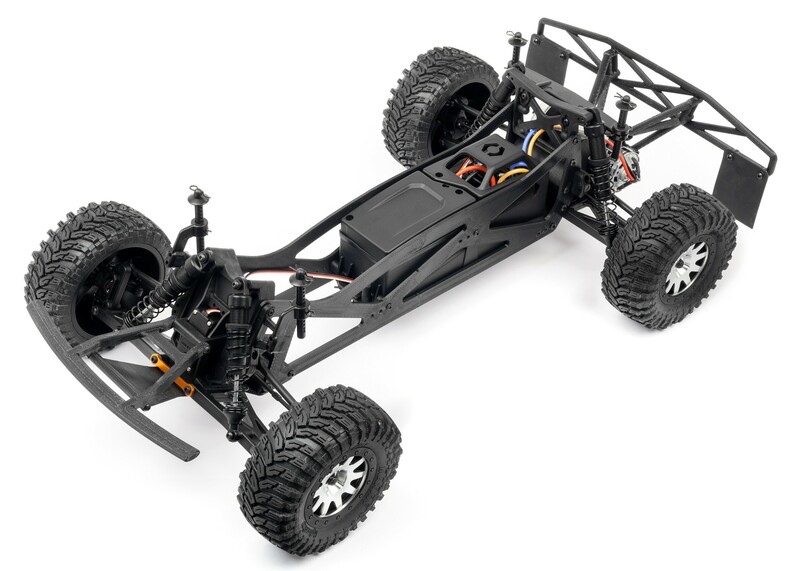 This is the one that intrigues me more than the others combined, the Jackal is along the lines of a full scale stadium truck, baja 100 racer or pre runner truck. The only downside for me is the body that looks a little on the cartoon rather than realistic side of things. 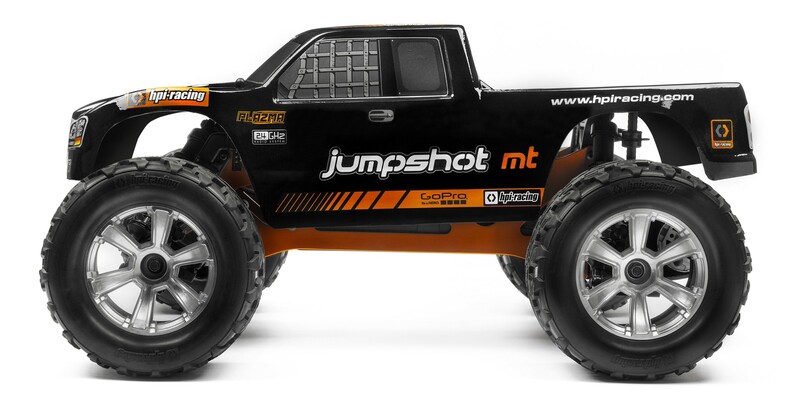 However it is a great looking vehicle in a similar design to the Axial Yeti. 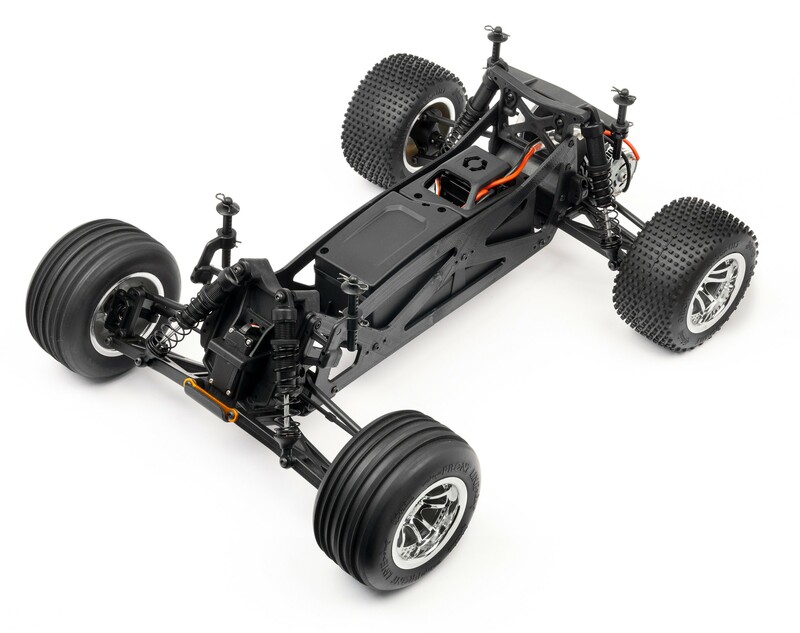 With an independent front and 4 link live rear axle it has the suspension configuration to much it’s 1:1 counterpart. I’d be excited to see a Short Course Truck using the same platform as well. Powered by a 3900kV brushless motor and controlled by their standard Cougar radio system, the Jackal #6544-F really appeals to me. It even looks to use Associated SCT tyres in the same size. For more details check it out at http://www.thundertiger.com/products-detail.php?id=63 and with any luck I will be able to review one some time! Sometimes I can review cars because I own one, sometimes borrow one, so far nobody is giving me any to review, but sometimes other review cars for me which is the case here. 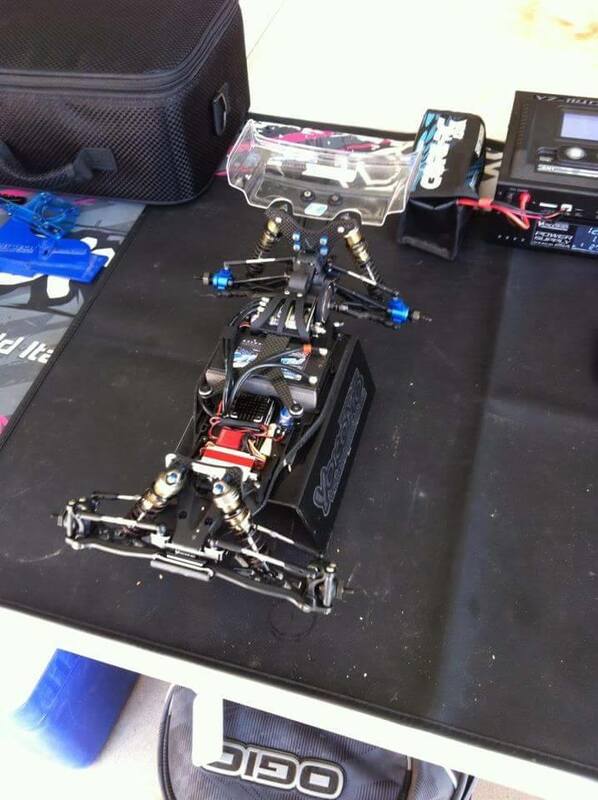 In this instance, a new reviewer in the form of Team Yokomo driver Chris Sturdy who has just recently built his new YZ-2. So we asked Chris to give us his thoughts on his new ride and this is what he had to say! Like all Yokomo kits the bags are all marked in number order allowing for easy identification of each bag and what order they need to be opened in. 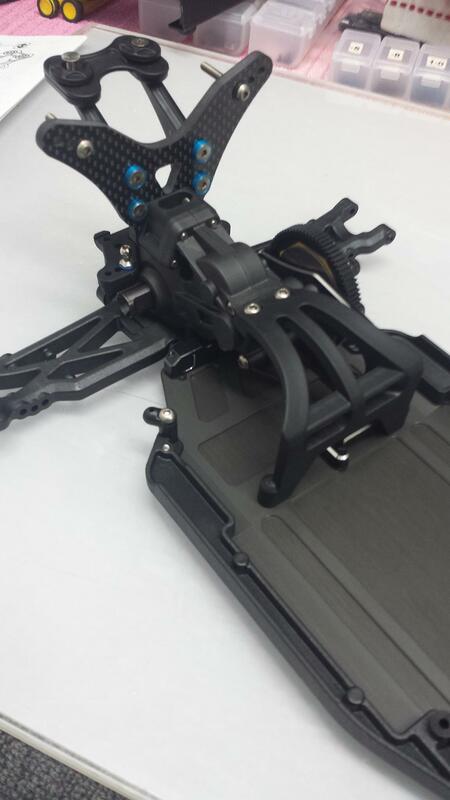 From the new bell crank and steering assembly to the all new rear suspension mounts the quality was top notch. I had no issues with the build, screws went into the plastic nice and smoothly without the need for excessive force while tightening. Some new features. 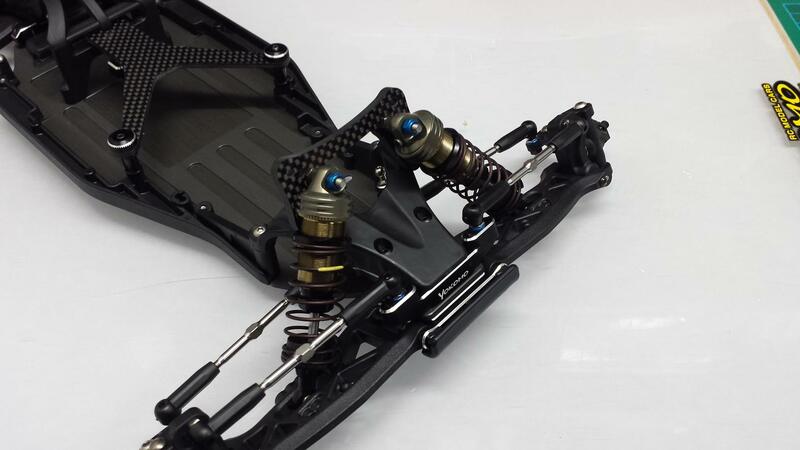 Yokomo has redesigned their steering system and is a big step up from previous buggies. The new system now includes 8 bearings instead of 4 like the Bmax2 allowing for a super free motion with the bell cranks. 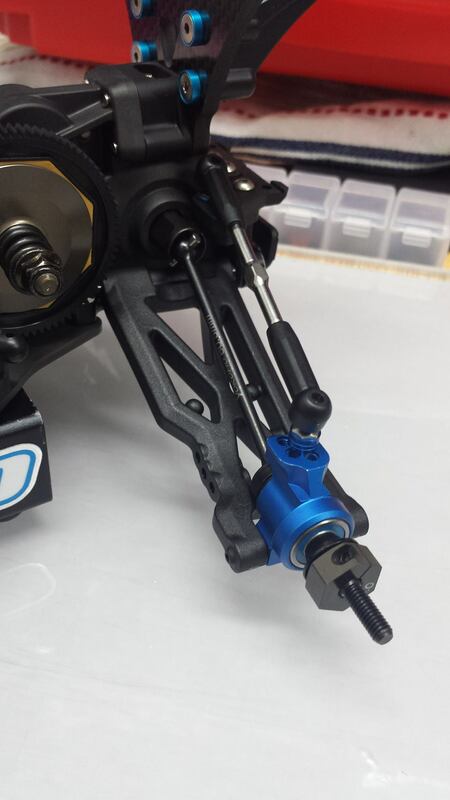 The new C-Hub design allows for a screw and kingpin instead of a suspension shaft this alloys for a very low friction steering system that feels great on track. 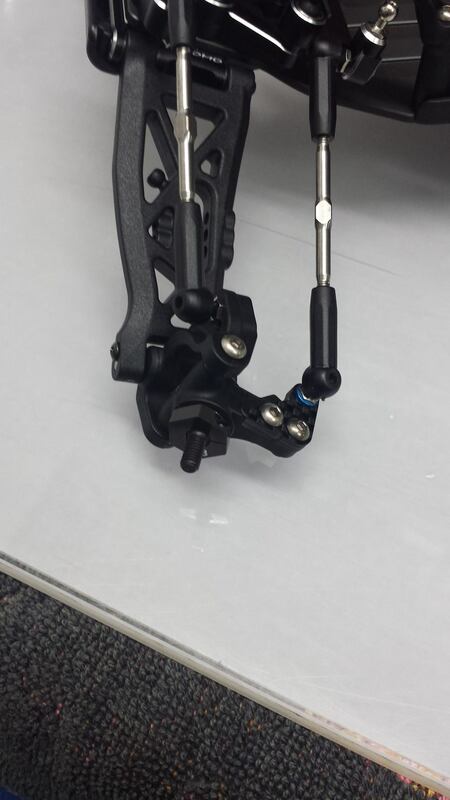 The new C-Hub design also includes changeable inserts to change Caster angles, In corporation with either the 25 degrees or 30 degrees suspension mounts the inserts now alloy for a maximum of 35 Degrees caster and a minimum of 20. 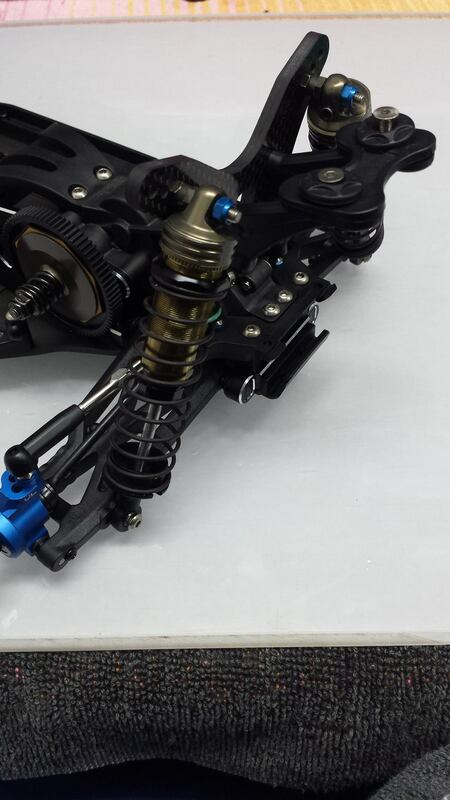 The biggest addition to the YZ-2 is the new Low-Profile forward Gearbox, The gearbox includes the top shaft, 2 idler gears and the differential. this kit include the Alloy top shaft as standard alloying for less weight in the gearbox giving faster acceleration and a lower enter of gravity. The idler gears are plastic but are a much bulkier design so durability isn’t an issue allowing for lighter idler gears instead of the alloy ones most people used on the Bmax2. The gearbox is now mounted on 3 rubber sheets which alloy for a floating gearbox which aids in forward traction. 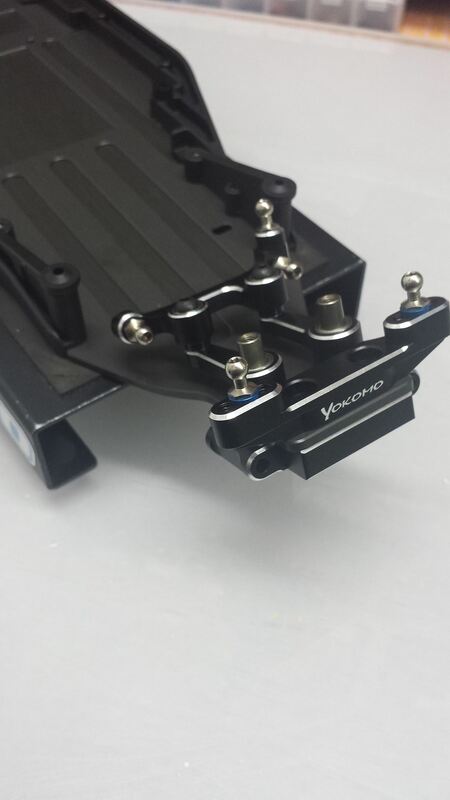 The new Rear suspension mounts incorporate the 4wd design using plastic inserts for easy adjustment of toe and anti-squat, the Shims that can either be placed under or on top of the RR block and RF block allow for a better adjustment of the roll centre by raising or lowering the suspension arms. Some things to note, whenever I build a car, any screw that is being installed into Alloy parts I always add a dab of locktite to the screw. this will almost guarantee that the screw will not come loose while on track. When installing the differential into the gearbox housing always check for any excessive left to right play and use very fine shims to adjust, In this kit I added a 0.1 shim on both the left and right outdrives inside the gearbox case. Here is a list of all the running gear I installed aswell as all the option parts I installed on the buggy. All together the car weighed in at a feather weight of 1550g with added weight included. Before the first run I was sceptical, but once I did a lap there was no doubt, this buggy was FAST, within the first 15 Laps I matched my best lap from the Bmax2MR the week before and only got better from there. I played around with camber links, camber, springs but didn’t change too much from first run and got used to the buggy. Compared to the Bmax2MR which I also ran on track during the day, The YZ-2 feels more nimble, Smoother cornering and turns more precise and aggressive without the rear end snapping through corner. The buggy jumps a lot flatter allowing for easy adjustment of throttle and steering through the air allowing for much more precise and smoother landings. Despite the more forward motor position the buggy still had tremendous forward grip and was wheel standing at some points. By the end of the night i posted my fastest 2wd lap, We are only starting to scratch the surface with the setup now and I look forward to testing the buggy more and more in the coming weeks. 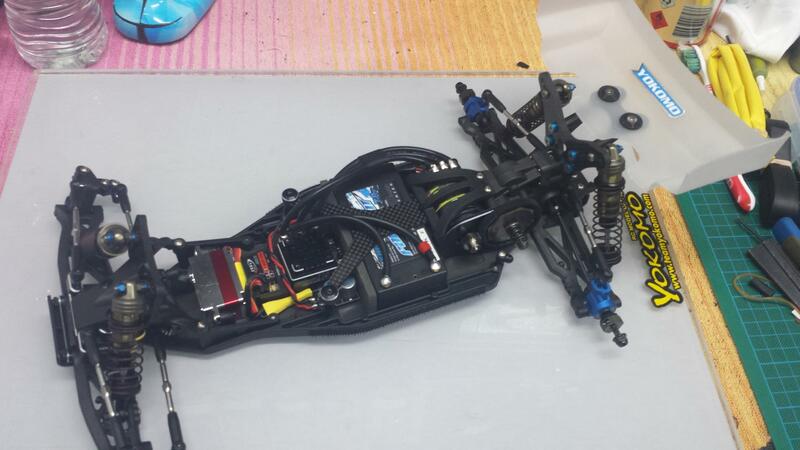 Here are some photos of the build and a video of a few laps at GCRC Raceway. 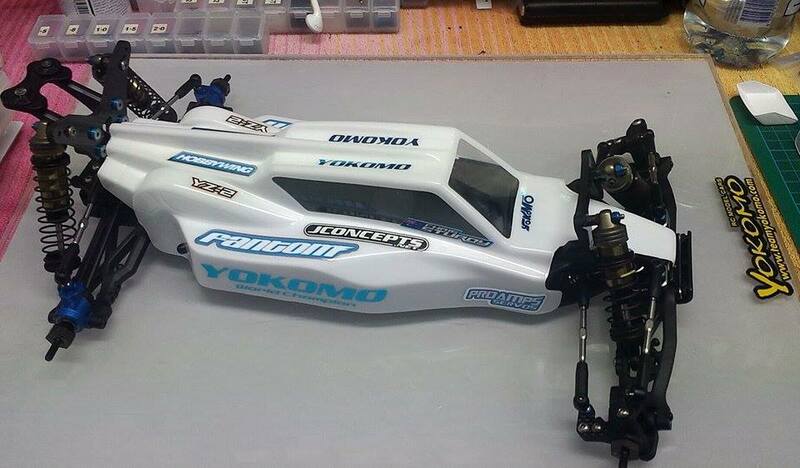 I would like to thank Team Yokomo for the support and the All new YZ-2, a weapon straight out of the box! 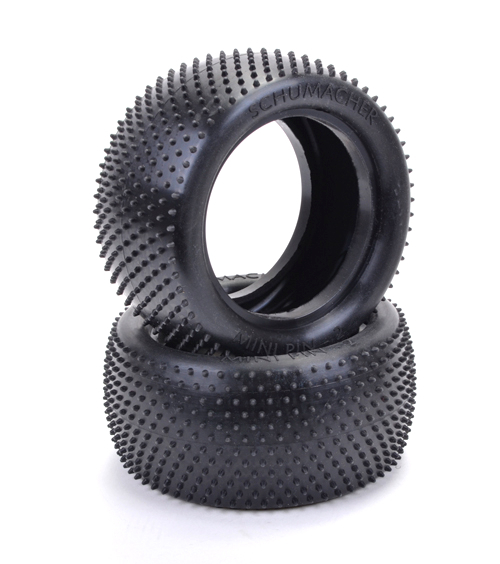 Schumacher have released a few new carpet tyres for your buggy this week. Firstly the new 4WD wide front stagger, this tyre has been developed for high grip astro and carpet surfaces. Aimed at providing more grip whilst keeping great stability associated with the staggered rib tyre. Secondly the new Mini Pin 2 rear tyre, this is a tyre for high grip astro and carpet racing. 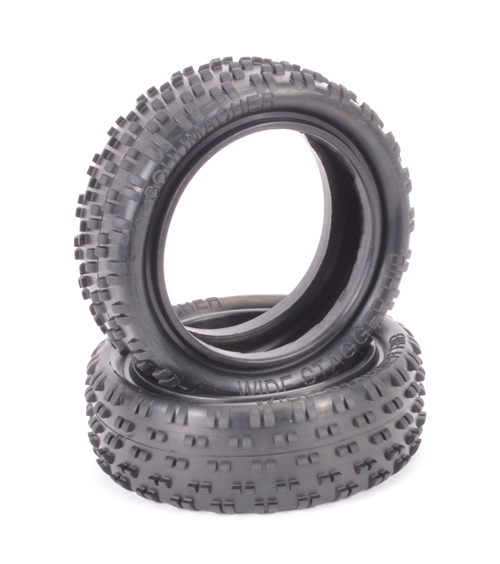 The new tyre has a thinner wall thickness which is aimed at providing more traction and improved bump handling. The pins have been designed to have more of a radius edge as opposed to the square edge on the previous and hugely popular Mini Pin tyre. This allows the tyre to work perfectly straight from the packet, without the need for bedding in. The Mini Pin 2 is available in Yellow, Silver and hard wearing Blue compound, the Yellow is available pre-glued on the Flexlite 12mm hex wheel. 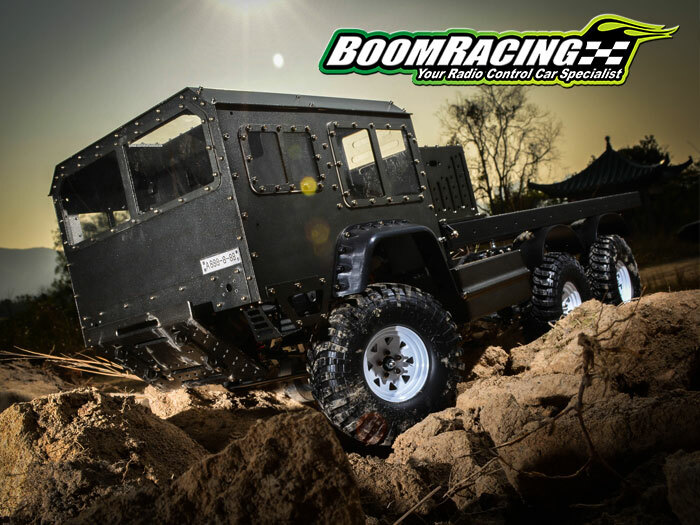 Yup, not one but three new rigs from Boom racing, and two of them are 6×6’s! They are a Land Rover D90, the G63 6×6 truck, and the 7GI Mil 6×6 military truck. The D90 is a ridiculously popular car, and we know that people are going to LOVE what Boom Racing has in store for them. This G63 6×6 truck has everything you need to get started with a 6×6 vehicle!